Ensuring good health is a human rights issue — and a gender equality one. Norway strongly supports equity and the empowerment of women as a path to national development. Women and girls are often the last to be served, their needs ignored. Lack of basic health and nutrition are some of the most egregious challenges faced by women, girls, and children. Every day, over 800 women and girls die as a result of pregnancy or childbirth complications — 99% of whom live in the developing world. More than 100 million children are chronically malnourished and 131 million girls are out of school. For these reasons, Norway focuses on the basics — working to ensure women, girls, and children can grow up healthy and access an education that will allow them to excel in society. Norway is committed to allocating around 1% of its gross national income on official development assistance — which is more than most countries. But alone, we can only hope to make a small contribution to addressing these far-reaching inequalities. We therefore work through partnerships with international agencies, civil society, the private sector, and, most importantly, developing country governments and communities themselves. As Norway’s minister of international development, I must think long and hard about where we choose to invest our citizens’ money. Achieving the United Nations Sustainable Development Goals (SDGs) by 2030 is a priority for Norway and we are proud of our commitment to people’s welfare and the environment. We've had a strong focus on investing in global health for decades — promoting vaccination, and encouraging strong, national health systems. We feel we have been part of the stories of success when it comes to the fight against HIV, polio, malaria, and other diseases. One of our most recent areas of intense activity within the global health portfolio has been building out a new Global Financing Facility (GFF) for women’s, children’s, and adolescents’ health, in collaboration with the government of Canada, the World Bank, and the Bill & Melinda Gates Foundation. Times change and the need for new approaches becomes paramount. In the past decades, national health budgets have expanded, and so too have diaspora remittances (funds sent by someone living in a foreign country to their home country). Aid, while still critical in many countries, is no longer the central financing modality to support national health systems. The annual health financing gap (estimated at USD$33 billion) cannot be closed by only mobilizing more aid. Recognizing these new challenges, Norway and our partners are turning the GFF into an innovative funding mechanism that tackles these new realities. The GFF is designed to build a sustainable source of funding for health and nutrition, and empower countries to take control of their own future and invest in their people. Together, the GFF and partner countries decide what problems are top priorities — and how to resolve them. The GFF and its supported countries then agree on how to finance the response, blending aid money with loans and other sources of private financing. The GFF aims to develop long-term financing streams to support national investment in sustainable health systems — as opposed to short-term projects. The model requires small investments from external sources, which are matched by a country’s own large-scale domestic commitments. The focus is always on the health and well-being of women, children, and adolescents. Early results speak for themselves. Launched this month, the GFF 2017-2018 Annual Report shows incredible progress has already been made over the last three years in 16 GFF-supported countries that have specifically invested more resources in bettering the lives of women, children, and adolescents. More progress is yet to come, thanks to long-term partnerships, as well as an expanding number of partner countries coming on board. Cameroon, for example, is now working with the GFF to invest in preventing under-five mortality and tackling chronic malnutrition. While their per-capita health expenditure is higher than many other sub-Saharan African countries, Cameroon has not had as much success as hoped in improving reproductive, maternal, newborn, child, and adolescent health. Cameroon has requested help from the GFF to change that. By 2019, Louis Montaze, Cameroon’s minister of economy, planning, and regional development, says they hope to decrease the chronic malnutrition rate from 32% to 25%. "[Working with GFF] has already allowed us to mobilize the government and its partners around [the] areas of health and nutrition of mothers and children, and the creation of a multi-sectoral coordination unit for these activities," Minister Montaze said at the Human Capital Summit. Doing so will lead to the reallocation of health spending in a more sustainable way and, hopefully, propel Cameroon forward to meet their 2019 goal. The GFF model works and is in high demand. Currently GFF works with 27 countries, which is a major accomplishment. But over 5 million women and children still die from preventable conditions every year across 50 countries with the greatest need. More funding is necessary to achieve SDG 3 on good health and well-being for all, and to reduce maternal and child mortality. On Nov. 6, in Oslo, Norway will be co-hosting the GFF replenishment with the government of Burkina Faso, the Bill & Melinda Gates Foundation, and the World Bank. Our aim is to raise $2 billion in new support over the 2018-2023 period, which would allow the GFF to develop partnerships with almost twice as many countries (from 27 countries to 50) and leverage billions more in domestic expenditure, loans and private investments. As Global Citizens, you each have a crucial role to play in ensuring we reach our goal. Keep tweeting, emailing, and raising your voices. Tell your politicians this is what you want to see — the international community helping countries to help themselves, by investing in their own people. I can’t wait to celebrate all the progress we’ve made with you on Sept. 29 in Central Park. 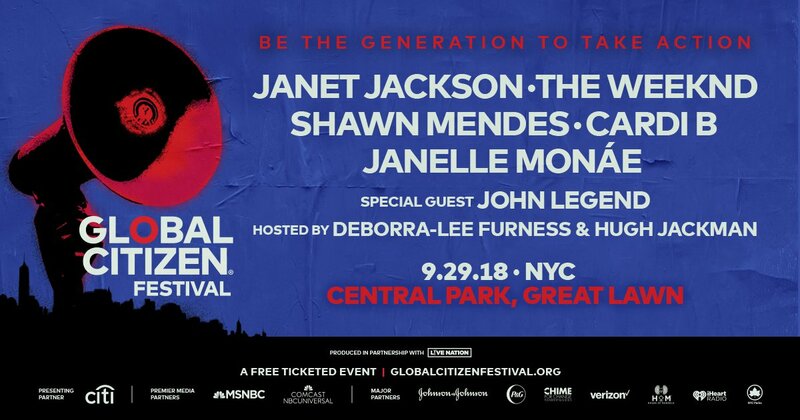 Global Citizen supports the SDGs and GFF’s efforts to achieve them. Join us in asking Canada, Germany, France, and the UK to invest in the GFF.